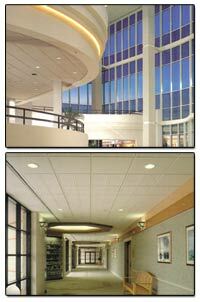 Interior Ceilings and Walls promises its customers superior service at competitive prices. Our knowledgeable team can help you with the latest in acoustical ceiling products, metal pan and linear metal ceilings, and our large in-stock inventory of first class wall systems, doors and frames, lighting products, insulation and more. Our continued return customer base can attest to our high level of dependability, competence and excellent service. Interior Ceilings and Walls, LLC is also the New England distributor for relocatable wall systems and partitions from Ultrawall.